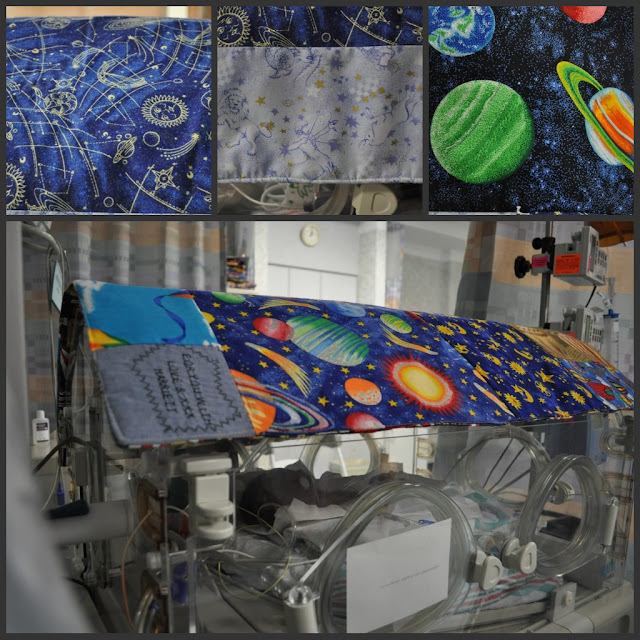 Every baby in the NICU gets a special quilt sewn by a local volunteer. When I arrived for a visit a few days ago, Merritt's new blanket was draped over his isolette. SPACE! Constellations, planets, hot air balloons, kites, astronauts, they're all here!! Just like his nursery we set up at home. AWW! How PERFECT!! Did they know that his room is SPACE THEMED!? I totally just got teary! THis is SOOO SWEET!! I love this! What a beautiful blanket! I'm also not big into "signs" but I wouldn't be able to pass that one up - someone is watching out for you guys! Wow, that's crazy that the theme was coincidental. Definitely a sign! Good things ahead for this little guy! how special & personal that must make him feel!! Amazing "coincidence" ;) I love it when stuff like that happens!